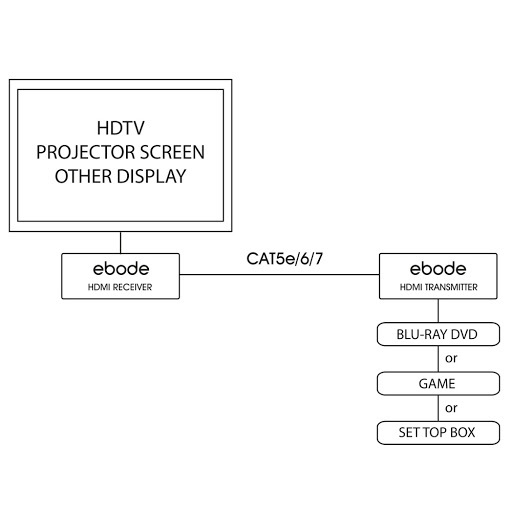 The ebode HD50 is an affordable solution for sending HDMI signals over one CAT5e/6/7 cable up to a distance of 50m. The ebode HD50 HDMI Extender is a cost e ective solution to transmit HDMI signals over single CAT5e/6/7 up to 50m. With 50 meter transmission the HD50 is suitable for family use while it o ers professional speci cations, supporting Full HD1080P, 3D and high quality HDMI 1.3 transmission . The ebode HD50 is HDCP compatible and also supports Digital Audio and Blu-ray Disk which makes it an ideal solution for family use and CCTV monitoring.